How to make bracelets out of yarn? Case for smartphone is not only protect the phone from external damage, but also the accessory that emphasizes the individuality of the owner. Cover woven from rubber bands loom bands is the best way to Express yourself. 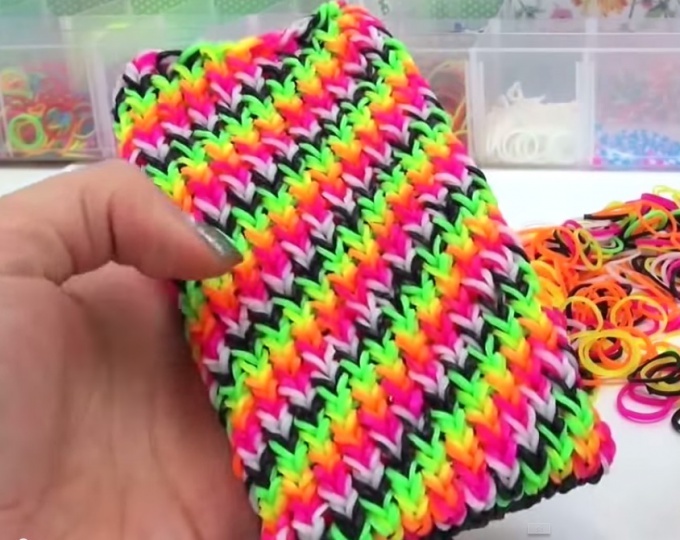 For weaving a multi-colored cover with a picture diagonally need a machine for weaving from loom bands Rainbow loom, more than 200 PCs colored rubber bands and a well-lit workplace. Take the machine out of the 12 pairs of columns and expand it to itself so that the hollows on the bars on the right looked forward, to the left of you. For the first row take the 11 bands of the same color. Each elastic roll twice. Wear a rubber band on the machine in the form of eight diagonally from the first left column on the second right, etc. Repeat a number of the opposite: from the first right column on the second left, etc. Should get a line crosswise. Pull the bands down to have a place for the other rows. Take 12 rubber bands 2 of the same color. Wear them vertically on the left of the line in the usual way, to avoid twisting, combining two columns and alternating colors: six rubber bands of different colors, then six bands in the same color sequence. Latest elastic band worn horizontally, uniting the right and left columns. The next row in the same colour scheme is repeated on the right lines. The last gum also incorporates the right column with the left. Hook, remove the bottom band from each column to form a knot. Again, do the color number for the left line in the same sequence, skipping the first color (the image was obliquely). And so the circle. Remove the hook of the lower gum. The following color wheel start with the third color, etc. After each mileage range remove the bottom elastic hook. The number of rows depends on the size of the phone, on average you will need about 33 rows. Following the last round and removing all the lower bands, go back to the first left column. Place your hook in the bottom layer of the two rubber bands from the first left column and put it on the second left, the second to the third column, etc. From the last column of the gum are removed on the right side, and the braiding of the loops continues until the last right column. In the last right column is necessary to make the fastening loop. Take the elastic and thread it through the bottom hook the elastic on the pole, tying it to the node. Carefully remove the remaining gum from the machine. Case ready.